Two years in the making, and it’s finally here. 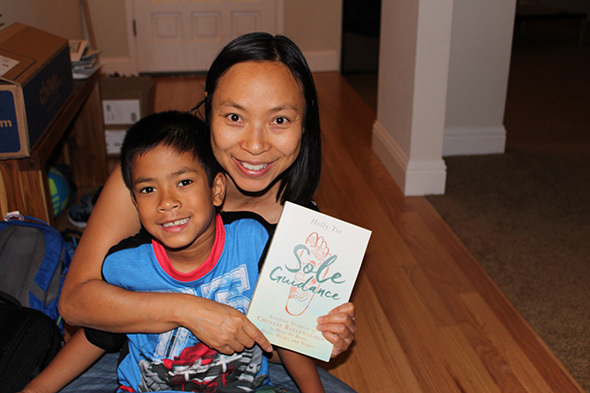 My new book, Sole Guidance, was officially released TODAY!!! Minutes after arriving home from Toronto, I discovered that Hay House sent me an advance copy of my book! Today, I should be working on getting the word out on my book. Unlike the golden age of publishing, these days book promotion is primarily the author’s responsibility. I’m lucky because my publisher, Hay House, is much more supportive than traditional publishers. They have a great online presence an impressive newsletter base, and everyone I’ve worked with has been amazingly professional, competent and caring. They even featured my article, how to get instant knee pain relief in 4 steps on the homepage of HealYourLife.com today. I really appreciate their support and am thrilled to be a Hay House author. That said, the bulk of the responsibility to promote the book falls on my shoulders, which totally makes sense to me. It is after all, my book. Who would know it better than me? I could totally stress out and push myself, but I’m being guided by my heart and soul to play. I’ve also been guided to kick off my book launch with 8 days of rest and then spend the next 28 days on caring, sharing and reader appreciation. It certainly takes a lot of faith (or utter stupidity—lol) to completely disregard traditional marketing methodologies. But I’ve learned from trial and error (mostly from error!) that when my heart speaks, I should listen. So I’m going to trust my inner guidance and watch what happens. I consider this an experiment to show that the heart really does know best. The book should also be available in traditional bookstores, and it’s available worldwide on Amazon’s international sites. I should also mention that Amazon in the U.S. is offering a deal where you can pick up your copy for under $10. Wow! My book is sold out in England! And with the awesome discovery that my book is #2 in the “reflexology” category on Amazon.co.uk, I believe that’s enough “work” for my official book launch day. About a week from now, I’ll tell you more about why this book rocks. Suffice to say, I poured my heart and soul into writing it. When I first started writing, my intention was to write the epic life-changing book that I knew in my heart that I was meant to write. Well, I wrote it (and a really awkward sentence preceding this sentence). 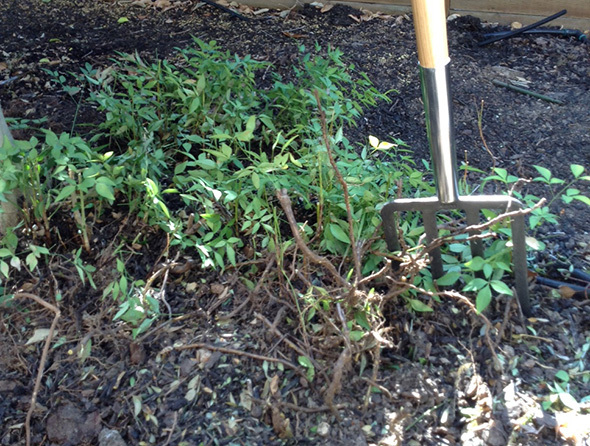 The guy at the nursery thought the shrub was “heavenly bamboo.” Not so heavenly to dig it up! If anyone knows what this plant is and a natural way to get rid of it, I’d really appreciate it if you’d let me know in the comments. Right now, I’m picking through the massive root system (about 100 square feet) with a pitchfork and manually yanking it out. 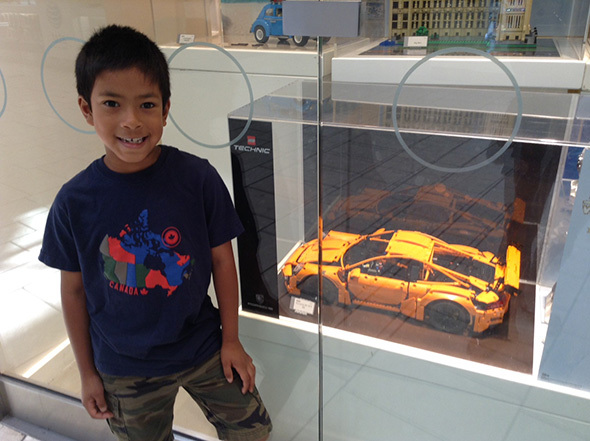 A certain little boy is turning seven soon, so I took him to the mall to pick out a birthday gift. He chose the winter village set even though it’s 100-degrees out. He said he wanted to build the Christmas tree. He’s really been into trees lately and visits the neighbour’s oak tree every few days. “Swimming” is in quotes because the same little boy is learning how to swim. We headed out in 100-degree heat (did I mention it’s 100 degrees out?) to practice blowing bubbles in the water. While it may not be entirely obvious looking at the couch, there are a whole bunch of stuffed animals sitting in a “tent” (the bed sheet is the tent). They’ve been roasting fish-mallows (the penguin version of marshmallows), and marking “trails” with K’nex pieces. And then it will be time to make dinner. 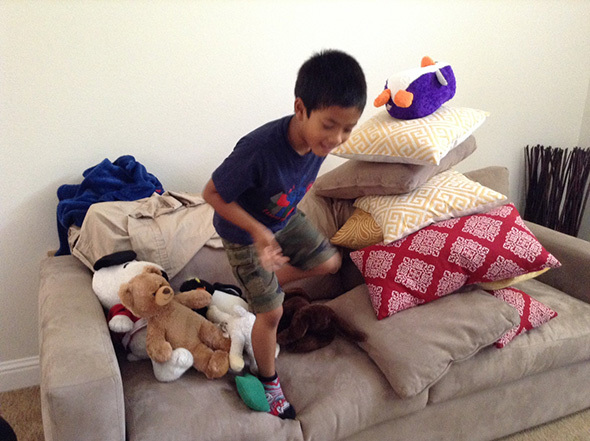 Later this evening, I’ll displace the stuffed animals so that I can veg out on the couch and watch Master Chef. 40 Responses to Sole Guidance: Official Book Launch! Massive congrats to you Holly! I wish you every success and look forward to ordering my own copy in the coming month. In your blog item above, curious as to above why ” 8 days of rest” was written in bold, something significant about number 8? Anyhow a well deserved rest! Thank you! 8 is a lucky number in Chinese. I bolded it because it was the exact phrase that kept repeating in my mind, so it felt significant to me. Please accept my heartiest congratulations on the launch of your book. Well done. I am itching to get my hands on this book. Placing an order next woo hoo! Keep mailing your monthly newsletters. Kudos to you! blessings. Thank you so much. I appreciate your enthusiasm! Very excited to know your book is now out and available. I am looking forward to reading it and even more practicing what is in it. I have used bits of reflexology on and off for years but now realize how beneficial it is I am hoping to learn a lot more. Thank you for writing this book to share with others. I plan to buy your book from my independent local bookstore. I am more excited to find out that your son is learning to swim! Good for you, MOM! Time well spent! My mother started us out by blowing bubbles in the bath tub and then playing ‘hide-and-seek’ ducking under the water at the pool. I earned money for college by teaching “drown-proofing,” Red Cross swimming lessons and life guarding. FYI: Accidental drowning is a leading cause of death for young children. Thank you for your support and the swimming tips! It was a good day yesterday. He fully submerged his head and blew bubbles. We’re working on the “starfish” back float today. Congrats on the release of your book Holly! I will certainly be buying a copy! Your advice has helped me and my family and I love the way you write. Keep safe. Wishing you all the best always, Melanie. Thank you so much for your support and well wishes. I’m so happy my advice has helped your family. All the best to you and your loved ones! Holly, you are hilarious! Sorry that I cannot help you out with naming the weeds. They do not look familiar to me. Congratulations on having sold out on Amazon UK!! This means I have to wait a while when ordering your book as only European Amazons are an option for me. Good luck with launching day 2 ? Probably something like that yes…. But the weather changes so quickly that it is more tolerable now :-). In the most south west part of Finland my relatives noticed the temperature showing 44 degrees Celcius a couple of days ago…..
Wow, I didn’t realize the temperatures had gotten so high in Finaland. That’s insanely hot. Congrats on THE BIG DAY. From your writings, I’ve made up my mind that your middle name is Genuine. Enjoy those well-deserved 8 days prescribed by the best doctor of all: Our Insides!! Congratulations to you Holly! You’ve been very helpful to many people, thank you for your commitment on giving back and being a blessing to others. Your handsome son really seems to be enjoying himself. Blessings to you, take care. Hi Holly, Thanks for a great blog, I’ve used your reflexology for headaches for my daughter and I, which has provided relief. The plant you have is Sacred Bamboo, also known as Heavenly Bamboo. The close relative with more foliage is Nandina Domestica and Nandina Pygmaea, I love all of these plants and have lots of them in my garden. During winter they go red with berries. They do not need much care, so I’m not sure what went wrong with yours? Its as if they never got started. Maybe yours needs a bit more loving care. Congrats and all of the best for your book! You’re very welcome. And thank you for identifying the plant, right down to the Latin name. It was getting out of hand and encroaching upon another plant, so I had to thin it out. So excited to be able to read your book and to do something to say thank you for all the education you have given us! Can’t wait to get my book in the mail! I’m so excited that you’re so excited :). Thank you!!! Thank you so much for pre-ordering my book! I agree that a reflexology book without pictures would not be very useful. I’m happy to say the book is full of illustrations, and there are pictures for all of the reflexology points in the book. I don’t know if the “search inside” feature couldn’t display them or if my publisher decided to leave them out in the preview. It would be awesome if the preview showed at least one or two pictures. I’ll follow up with my publisher to see if it’s possible. Congratulations!! and what a wonderful day with your son at this special event of the publishing of the book that you was meant to write. Thank you also for your newsletters and blog. I read your writings with great interest and like the way you present things. Thank you so much. I’m glad you enjoy my blog and newsletters. Congratulations i have just ordered my copy from my local book store. Holly, well done on launching your book and keeping your priorities straight! Any book signings in the Santa Clara area? I love your written voice and look forward to the book. Somehow I missed it; did you pick the author photo in lucky red? Thank you so much! No book signings planned just yet, but perhaps something in the new year :). The blue shirt photo won. You have a great memory to remember the lucky red shirt! I have been struggling with some health issues lately and was led to the Hay House website (not something I check regularly), saw your book and instantly went to Amazon to look inside it. Bought it without hesitation. I am soaking up every word and know that I was Divinely drawn to it. Every few pages and I have to set it down and almost laugh because of the synchronicity! Excited to start this chapter of my life! So glad I was led to your awesome book! I’m so happy to hear that the book showed up at the perfect moment for you. What a “serendipitous coincidence”! Although it appears you already know that there are no such things as coincidences :). I’m so excited that you’re starting a new chapter in life, and wish you amazing health and vitality.